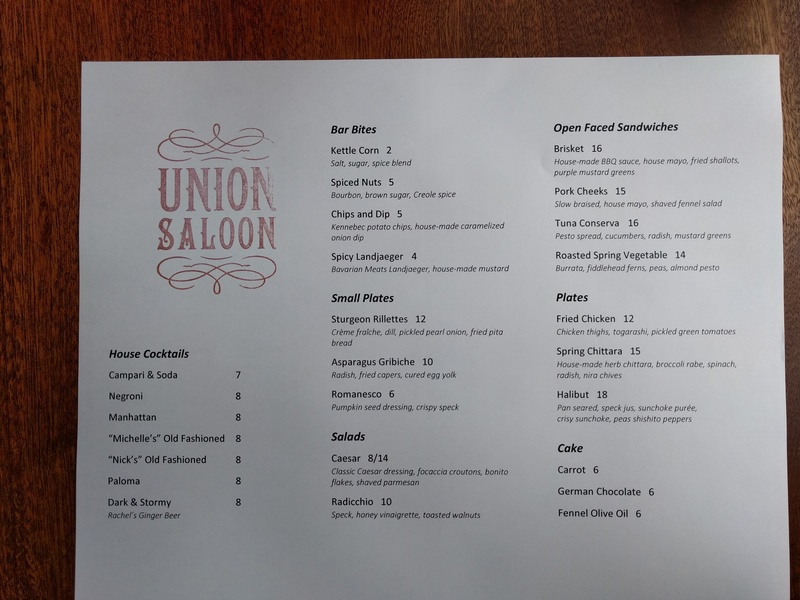 Those of us living in south Wallingford now have another dining option with the opening on Wednesday (May 10) of the Union Saloon — across from Cantinetta on Wallingford Ave. I’d been watching the renovations over the past several months wondering what was going on at that location, and on a recent Friday night, my wife and I popped in for dinner. I have this agreement with the city that whenever a business changes hands, someone goes in and removes from my brain all memory of what used to be there. I’d like to think that this frees up space for other things, but whether it does or not, that memory was reinstalled by a reliable source who reminded me that the site was formerly home to a landscape architecture business. 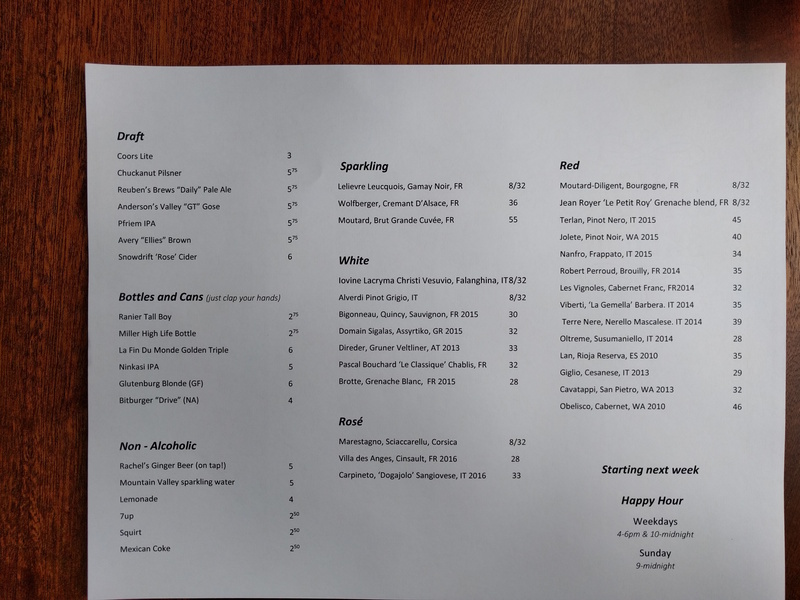 The proprietor of Union Saloon is Michelle Magidow, alumna of Seattle restaurants Lark, Salumi and Harvest Vine among others. 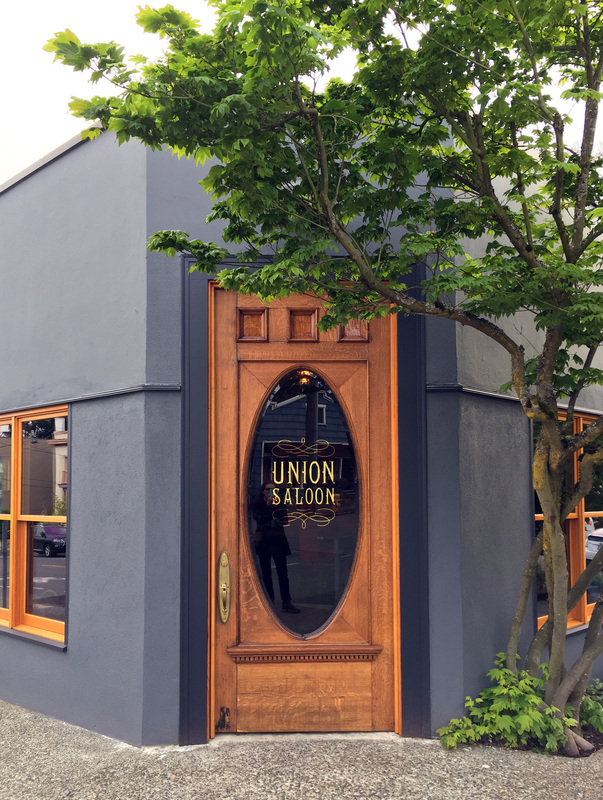 Union Saloon is Michelle’s first turn at taking the reins assisted by chef Blake King, a relative newcomer to the Seattle restaurant scene. Michelle chose Wallingford to open up shop, “because it is still tucked away and I like it here with the view of the lake.” Lucky us! We arrived on the early side — around 5:30, I think. But already, business around the bar was brisk. We found a table easily, but by the time we departed a couple of hours later, the restaurant was nearing capacity. Our server started us off with a bag of complimentary spicy popcorn — welcome, but a bit of a surprise considering the highly refined presentation of the items on the menu. That was followed by a caesar salad for me and a radicchio salad for my wife. The radicchio was dressed with something like a balsamic, but while it had the expected vinegary bite, it also had an alluring sweet taste. Recommended! For mains, I had the open-faced pork cheek sandwich (loaded so that it’s not something you would attempt with your hands even if it were, ummm, closed-faced). The pork pulled apart with a fork. Delicious stuff. Some friends that happened by the window joined us at our table, and commented on how good my pork looked. My wife had the halibut which was excellent, but she had snarfed it all down by the time our friends arrived. We might have left it at that, but the presence of our friends gave us no choice but to order dessert while we carried on chatting with them. What a fortunate turn of events! We would not have wanted to miss out on the fabulous cakes made in-house by Michelle. My wife ordered the chocolate cake while I ordered the carrot cake (a flip flop for us). You can’t go wrong with either one, but we both felt the carrot cake was the stand out. Many carrot cake chefs seem to try to make up for deficiencies in their cake by slathering on tons of cream cheese icing. (Yes, I know that has its pleasures.) This cake was so good that it didn’t need to hide under a mountain of frosting. The cake was so moist and busting with raisins and carrot that it seemed like a scoopful of produce smashed into a cake shape. So needless to say … save room for dessert! Thanks for the write up. I’ve been curious about the space as well but could find limited info online.